Toddlers - Hearts in Hand Child Development Center Hearts in Hand Child Development Center Your best source for quality childcare and preschool in Fort Collins. 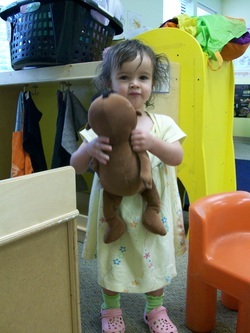 Our toddlers program serves children ages 2-3 years. This room is our transitional room from toddlerhood to preschool. Potty training is a goal during this developmental period. The Toddler staff coordinates a basic routine learning center free play, outside play as well as structured activities and group time. Activities and learning centers include all areas of development and are theme related. Our curriculum includes basic learning units and themes. Toddlers are introduced to phonics through our interactive Zoo-Phonics program. Low ratios of 1:5 are maintained in order to provide one-on-one attention during the day. Children nap midday on mats. Parents are responsible for providing diapers and wipes until the child is potty trained. Snacks are provided in the morning and afternoon. Lunch is provided M, T, Th. Parents provide sack lunch on Wednesdays and Fridays.